Content management is the means to ensure that the information an organization issues is accurate, on-target, legally compliant compliant, and consistent. 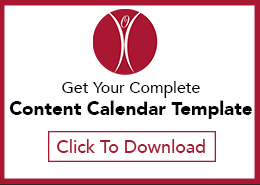 True content management, then, encompasses Web content, call center scripts, direct marketing materials, sales presentations, press information, advertising, product information, executive speeches, etc. Imagine if your customers could go to your store, your website, your salespeople, or your call center and get the same information. Imagine if your salespeople, executives, communications department, and customer service representatives all knew what each other was saying, and were sure that their information matched. Web-based content is a good place to start managing content, for several reasons. The Web is a relatively new channel, so its structure and habits are less entrenched in organizational culture. In addition, the Web brings together information from disparate parts of an organization, making information gaps and inconsistencies obvious and making collaboration necessary. Finally, technology exists that can enable content management on the web. On the web, content management means publishing information. Good web content needs a publishing process behind it, to ensure that it is accurate, up-to-date, on-brand, and serves the needs of the author and organization who generate it, as well as the reader. Software tools can automate some of the content management process, but content management can happen without software — and the thought processes drive the content management requirements — not vice-versa. The real goal of content management is to integrate all of that information so that, as a whole, an organization is saying the same things. The hype about content management is that technology exists that will, by itself, enable organizations to be more productive and reduce the cost of publishing content. However, unless an organization has solved the business processes related to creating and generating information, technology can only enable the problems. what information was the recipient looking for, and did the information provide that? why was the recipient looking for that information, and did the information meet that goal? what was the organization goal in communicating the information, and was that the right one? Most organizations don’t know the answer to these questions. And, to complicate matters even more, they don’t know much at all about what information is being communicated from various parts of an organization to various audiences — in other words, whether several business units or departments are saying different things about the same things, to the same audiences. Content management efforts cannot only reside in the communications department, although communicators should take a leadership role. They cannot be centered in IT, although technical developers need to be involved through the entire process. There needs to be a cross-functional team devoted to assessing what the organization’s content management needs and opportunities are, given that organization’s culture, business goals, and audience needs. If content management is seen purely as a technical project, its focus will be on the implementation of a software package, vs. a significant shift in business process. When a technical firm is engaged for a content management project, it usually begins with a relatively brief “requirements gathering” phase, conducted by technical business analysts. Because business analysts use different terminology than internal content contributors, it is likely that the processes will not be captured completely. EXAMPLE: Communicators do not use the term “workflow” to refer to their publishing process. And content contributors who do not come from a communications background will not always be able to identify their publishing process, since they may not have a standard process. At best, this requirements gathering will document a sample of the organization’s current processes, which will then be used to develop the rules for the content management system. This creates a system that will be organizationally obsolete before it is implemented. Developing a strategy for content management — vs. gathering requirements for a CMS implementation — is a large-scale project of its own. The more well-thought-out your organization’s content management strategy is, the more effective a CMS can be. If your organization is ready to develop a content management strategy, contact Content Company. 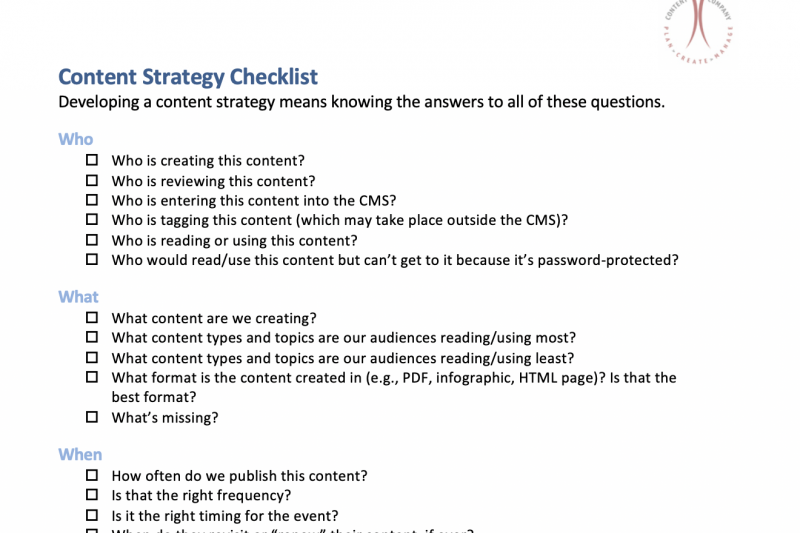 Content strategy checklist: Do you know how your organization’s content works?